True structural quality, aircraft grade 6061 T-6 aluminum. Certified double heat treat. CNC machined for precise tolerances. The strongest, roundest, straightest lightweight wheel you can find. 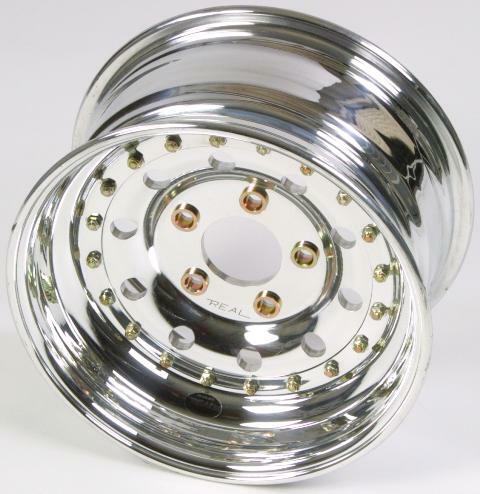 All wheel halves are spun to precise tolerances to insure uniform material thickness. Pressed in steel lug hole insert insures that the wheel will stay tight and bolt up true. Safety bead on the non bead-loc eliminates the need for a bead-loc in all but extreme cases. Three Piece design with replaceable rim halves. 1" drop center to clear all but the largest 4 piston calipers. Available in 1" backspace increments only. The size of the wheel studs. The number of wheel studs per wheel. The size of your hub center hole (center bore). Wheel Terminology definition. Bolt Circle 4 x 100mm. 4 x 110mm. 4 x 130mm. 4 x 4-1/2 in. 4 x 4-1/4 in. 5 x 100mm. 5 x 108mm. 5 x 130mm. 5 x 4-1/2 in. 5 x 4-1/4 in. 5 x 4-3/4 in. 5 x 5 in. 5 x 5-1/2 in. 6 x 4-1/2 in. 6 x 5-1/2 in. BackSpace 01" 02" 03" 04"
BackSpace 01" 02" 03" 04" 05"
BackSpace 01" 02" 03" 04" 05" 06"
BackSpace 01" 02" 03" 04" 05" 06" 07"
BackSpace 01" 02" 03" 04" 05" 06" 07" 08"
BackSpace 01" 02" 03" 04" 05" 06" 07" 08" 09"
BackSpace 02" 03" 04" 05" 06" 07" 08" 09"
BackSpace 03" 04" 05" 06" 07" 08" 09"
BackSpace 04" 05" 06" 07" 08" 09"
BackSpace 05" 06" 07" 08" 09"